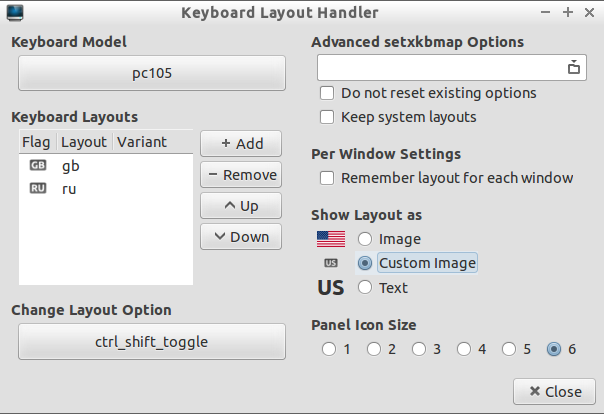 I have written recently about multiple keyboard layout settings in different Desktop Environments. The first article was about Unity, KDE and GNOME3. The second part of series was about Xfce, Cinnamon and MATE. I also created video how-tos for this. Today we will talk about less popular, still existing desktop environments: LXDE, Enlightenment and OpenBox. LXDE stands for Lightweight X11 Desktop Environment. It is not really a desktop environment such as KDE or GNOME. It does not have a central component. Instead, it is a set of standalone tools that work nicely with each other. 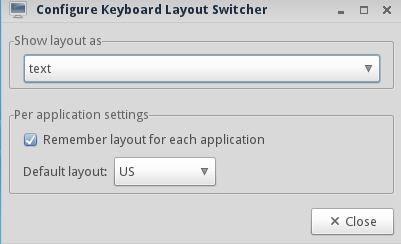 Unfortunately, there is no default keyboard layout configuration utility in LXDE, and this leads to a problem in some distributions. However, there are some exceptions. First of all, I'd like to mention Lubuntu. 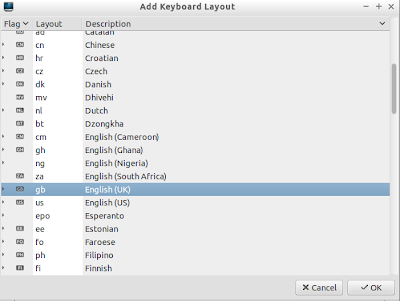 Some Lubuntu versions feature a "Keyboard layout handler" item in the panel right from the start. If there is no indicator from the beginning, you can add it by right-clicking the panel and selecting the menu option "Add/Remove Panel Items". By default, you have an US indicator there. 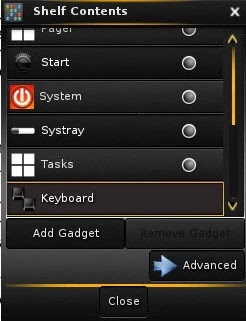 Right click on it gives you an option to go into the Settings mode. Here you need to untick the "Keep system layout" checkbox, which opens up the way to configure your own set of layouts. Click Add button to select another layout for the list. Using Add, Remove, Up and Down buttons, you adjust the list to your taste. 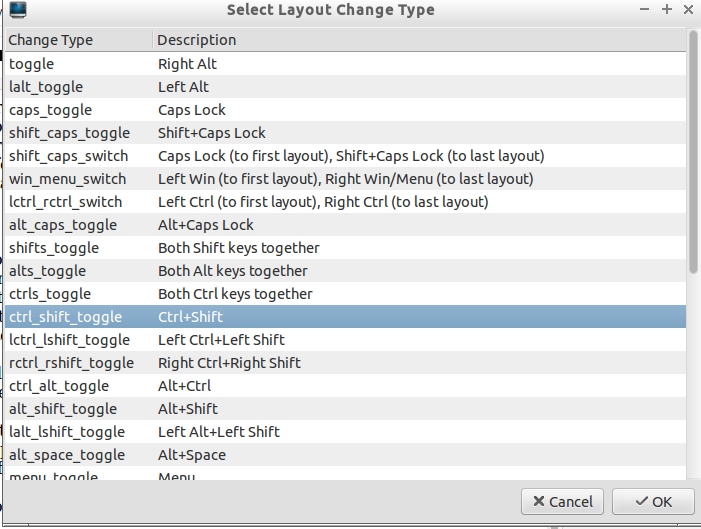 When done, click the Change Layout Option button to select the switch hotkey. 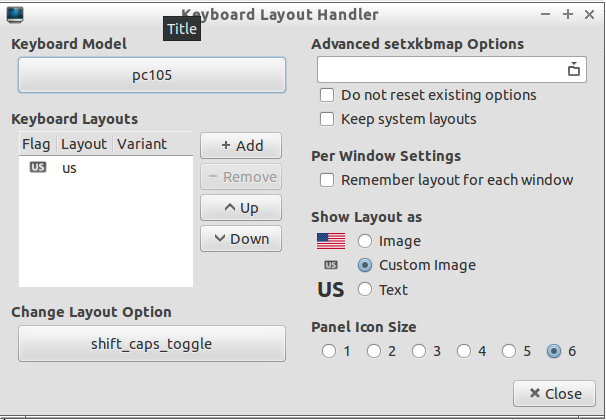 On the right part of the configuration window you can select how the layouts should be shown on the panel: text, flag or custom image. Also you can adjust the size of the indicator. When ready, Click Close. Voila, you are now ready to type in multiple layouts in Lubuntu's LXDE implementation. Another exception from that rule is ROSA Marathon LXDE. It includes the utility fsKBsetting. This is a graphical frontend for the setxkbmap bash command. 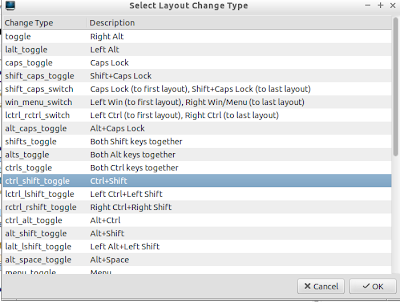 In addition, ROSA LXDE includes Keyboard Layout Switcher panel indicator. Having these two utilities resolves the problem of multiple keyboard layouts - their use is simple and straightforward. Apart from Lubuntu and ROSA, you can use LXDE on other Linux distributions. 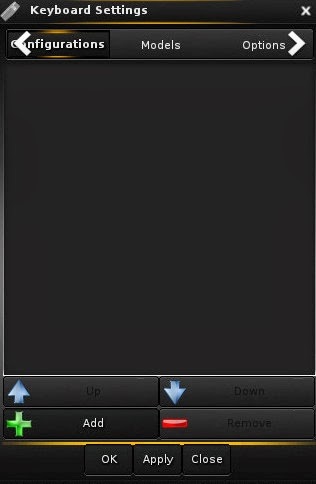 Luckily for you, fskbsetting was ported to them as well. Search for fskbsetting in your package manager or Internet, and it is likely you will get it. Users of Ubuntu-based distributions you can find fskbsetting in FSnow's PPA. Mandriva users can get it here. Enlightenment, or E17, is a modular lightweight desktop environment with a decent army of followers. The most popular distribution that uses E17 is Bodhi Linux. 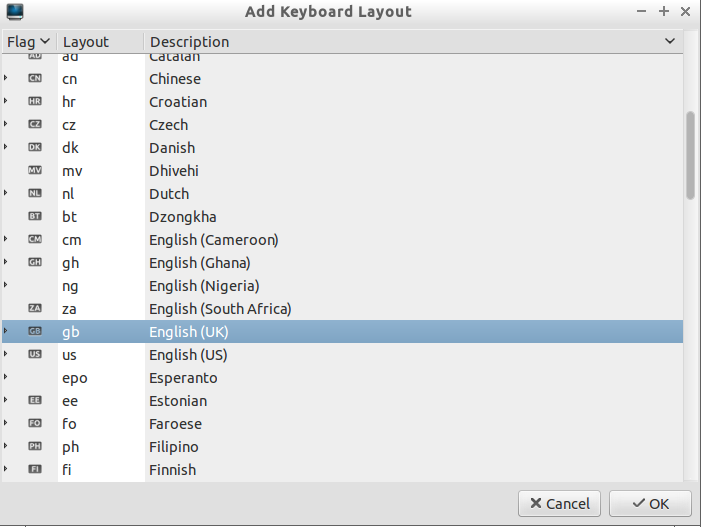 To configure keyboard layouts in Enlightenment, select the menu option Settings - All - Input - Keyboard. You will get a panel with several tabs. The first tab, although it isn't obvious, lists the available keyboard layouts. Using the Add/Remove/Up/Down buttons at the bottom of the tab, you can adjust the list to have the layouts you need. While choosing the layouts, you need to scroll through the list of available options. 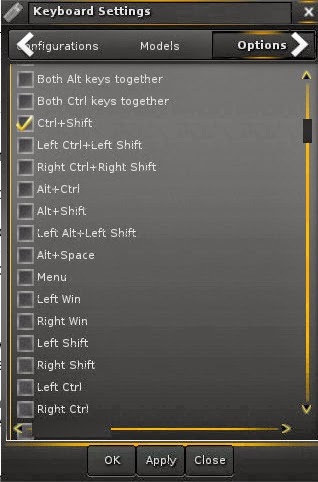 When you have finished with the list, switch to the Options tab, where you can select the switch hotkey combination. Unfortunately, Enlightenment does not put the layout indicator into the notification area of the panel. To do so, right click on any part of the panel and select the Content option. Scroll through the list until you see the Keyboard option. Select this item and then click Add gadget. By default, the indicator appears at the end of the list, but you can rearrange items by right clicking on the panel and selecting the Begin Moving Gadgets option. Voila, you can now use different keyboard layouts in the Enlightenment desktop environment. Openbox is a very lightweight desktop environment. It is so lightweight that it is difficult to say whether it is actually a desktop environment, or just a window manager. The line is so fine! The most famous distribution that comes with Openbox by default is Crunchbang, or #!. What can I say about options to configure different keyboard layouts for Openbox? There are two main moments. On the positive side, Crunchbang comes with fbxkb package installed. It runs automatically and shows you a current keyboard layout in the system panel. On the negative side, there are no graphical tools in Chrunchbang to configure multiple layouts and a switch hotkey. You need to do this manually. I would recommend this article which has a detailed explanation. What is your desktop environment and what is the set of layouts you use? For openbox and other non DE environments, i would recommend xxkb or qxkb instead od fbxkb in Openbox (#!). 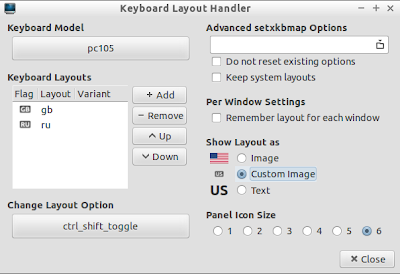 They allow per window keyboard layout management, as opposed to xxkb that controls that globally. Thanks for the valuable addition, Demian!